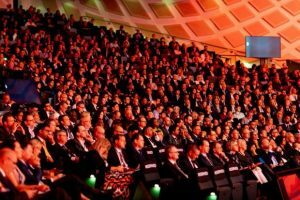 The 2018 SIBOS Conference returned to Sydney October 22 through October 25th. The event was held at the International Convention Center and had more than 7,500 attendees. The week’s themes related to financial technology, and the increasingly digitalized world of banking. 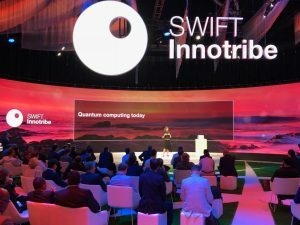 Shayne Elliot, Chief Executive Officer of ANZ Bank, stated one of the weeks major themes in his keynote address, describing how banks need to become increasingly more agile and adaptive to the technological advances in society. 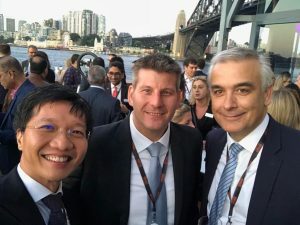 Kelvin Tan, Founder and CIO of GTR Ventures attended the week’s events along with portfolio company Tradeteq – represented by Mattia Tomba and André Casterman. 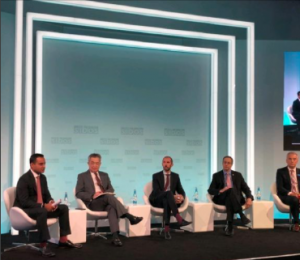 Mattia Tomba, Director Tradeteq and Head of Tradeteq Asia, pictured above at the HSBC Panel Event at Sibos 2018. The panel shared their thoughts on the evolution of trade finance as an asset class, and included Surath Sengupta – Global Head of Trade Portfolio Management at HSBC, Kah Chye Tan – Founder of CCRManager, Alexander R Malaket – CITP CTFP and President of Opus Advisory Services International, and André Casterman – Non-Executive Board Member and Chair Fintech Committee ITFA. 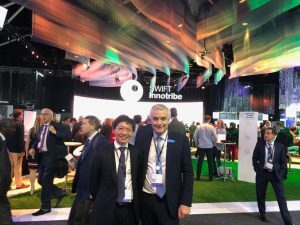 GTR Ventures is looking forward to SIBOS 2019, which will take place in London September 23rd through the 26th.